I am not a huge white potato fan, but I can’t say no to sweet potatoes or red potatoes. 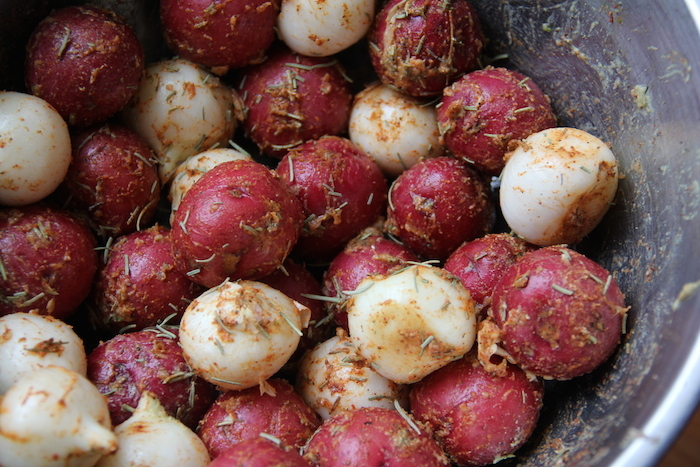 I find red potatoes incredibly delicious, even when cooked in the most simple way possible. I also like that they bake quickly because of their relatively smaller sauce and are that much closer to my tummy! 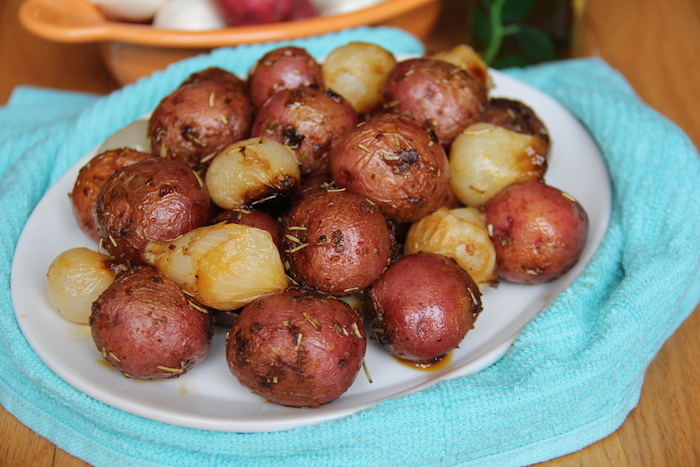 The following roasted red potatoes recipe is seasoned with rosemary and garlic and cooked to ultimate perfect. You won’t be able to get enough. Enjoy! Red Potatoes: are rich in iron, potassium and vitamin C, lending to increased energy and the better functioning of cells, tissues and organs. Red potatoes are packed with antioxidants called anthocyanins; in fact, 5-times more than the regular russet potato. 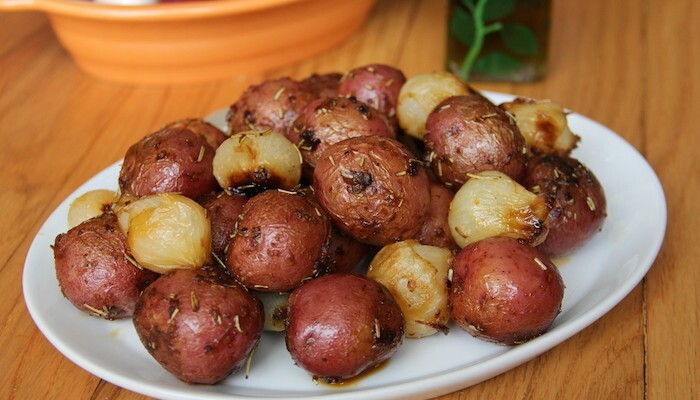 Red potatoes also contain protein – about 4 grams per medium-sized potato. Directions: Preheat the oven to 375 degrees Fahrenheit. Peel the onions (keep them whole), and place them in a large bowl with the potatoes (also whole). 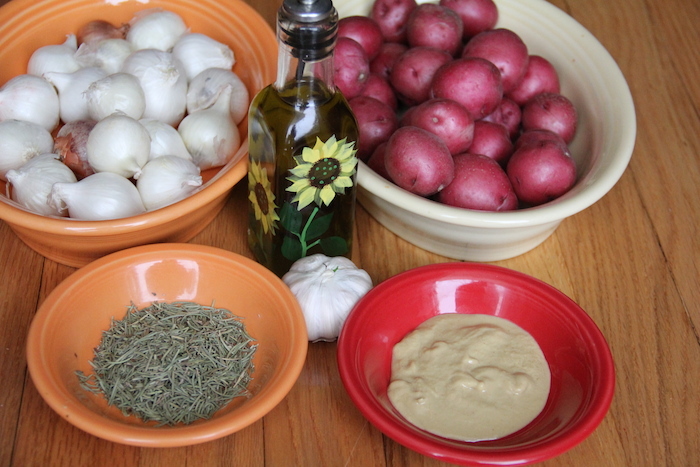 In a small bowl, whisk together the remaining ingredients and Pour over the onions and red potatoes. Toss with clean hands until all of the onions and potatoes are evenly coated. Transfer to a roasting pan and cook for 45-60 minutes or until the potatoes are tender to the core and slightly browned and the onions caramelized. 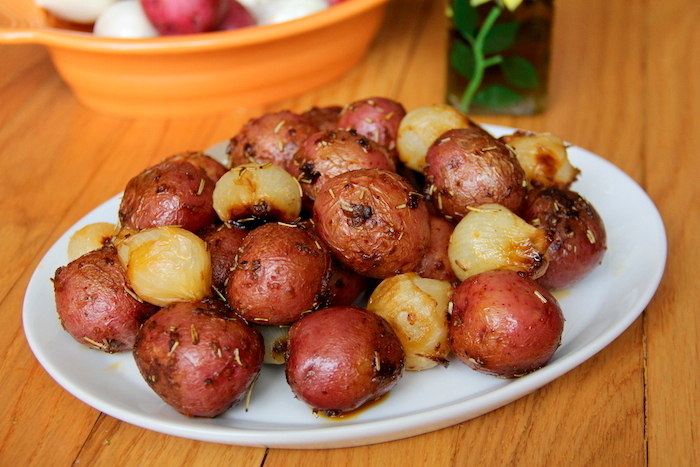 After 20 minutes into roasting, give the onions and potatoes a light toss to facilitate evenly cooking them. Serve and enjoy! This entry was tagged detox recipes, easy healthy recipes, going vegan, good vegetarian recipes, great vegetarian recipes, healthy, healthy breakfast recipes, healthy dinner recipes, healthy food recipes, healthy recipes, heart healthy recipes, how to become a vegetarian, oven roasted red potatoes, quick vegetarian recipes, red potato, red potato recipe, red potato recipes, red potato salad recipe, red potatoes, red potatoes recipe, red potatoes recipes, roasted red potatoes, roasted red potatoes recipe, simple vegetarian recipes, vegan, vegan essentials, vegetarian, veggie recipes, what is a vegan, what is vegan. Bookmark the permalink.